Growing up we had fruit trees and I got all the benefits (read: eating) without any of the work. Now suddenly with the SNOW Block Alley project I find myself with five apple, three pear, a cherry and the most recent addition, a Cot-n-Candy apricot/plum mixture tree. The maintenance to keep them healthy seems overwhelming but luckily I have some help lined up. John Dodson has a degree in horticulture and over 40 years experience. Plus he’s a nice guy and as nice guys do, John came to the rescue. He came to the alley one sunny Friday afternoon late in February to give me and a few of the neighbors a lesson in pruning fruit trees. 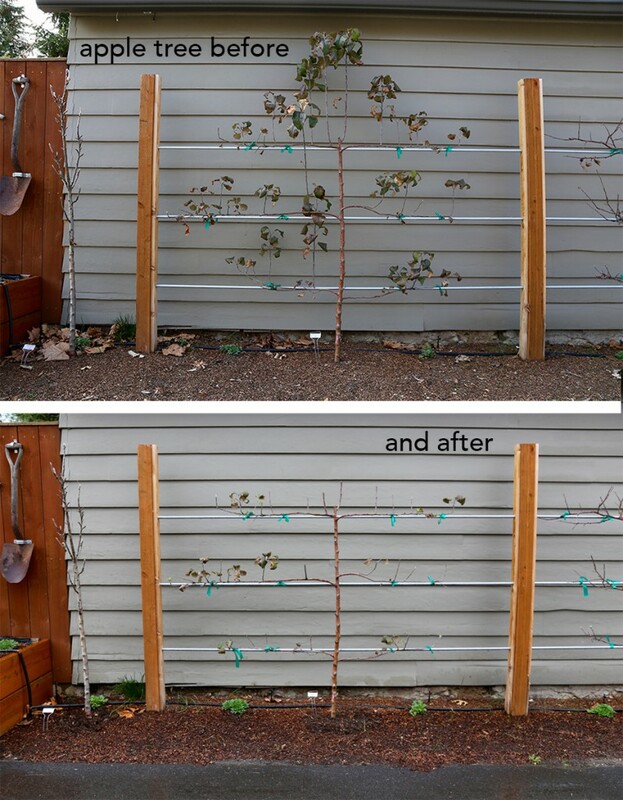 Just a note here – because our garden has limited space – especially width – most of our fruit trees are espaliered but trimming techniques are the same regardless. Clippers – I like the bypass variety. The two curved blades give a clean cut, but more important than the type of pruners is that they are sharp! 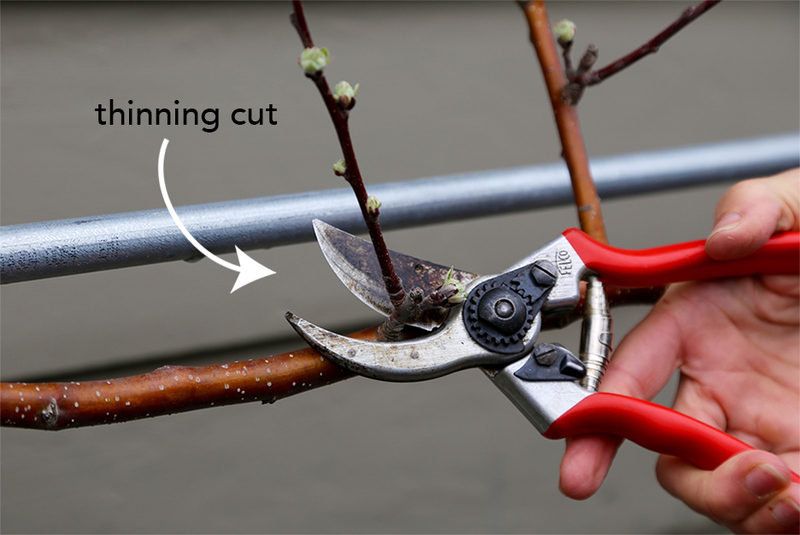 A dull pruner can mangle the branch which makes it harder for the plant to recover and heal itself. Sanitization – It’s important to disinfect your pruners between cuts. If that’s just asking way too much, at least sanitize them between trees. Consider it insurance agains spreading disease between your trees – disease you might not even know your tree has…yet. While there’s commercial products available I’m all about making this easy and affordable. A solution of 1 part bleach to 9 parts water will do the trick but make sure you wash and dry the blades when you’re done for the day as the bleach is very corrosive and hard on your pruner blades. 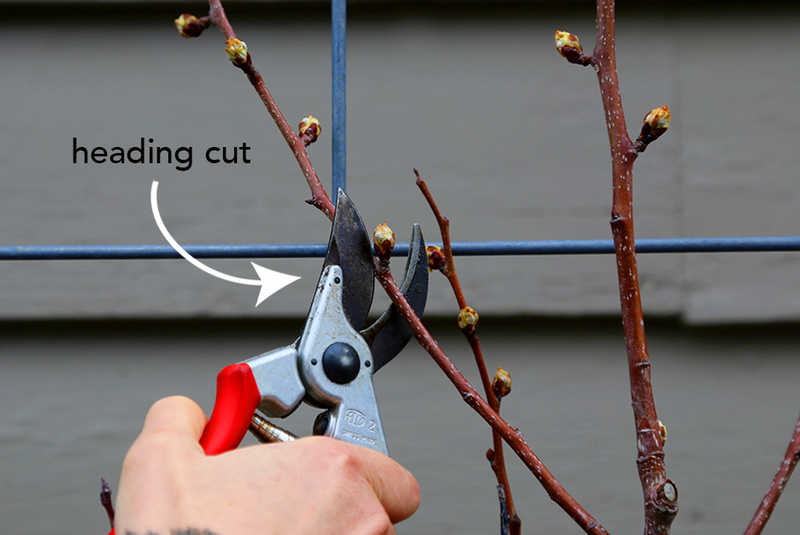 The best time to do pruning is in the spring when the buds are just starting to swell. Here in Idaho that’s early to mid March depending on the year. Remove any dead, diseased or broken limbs. Prune out any limbs that are crossing or crowding each other. Consider the shape you want for your tree and prune with that in mind. For the espaliered trees this means some pretty heavy trimming to remove rogue branches going in directions other than the lateral shape I’m working on establishing. Make sure that the canopy is open and airy. This helps with flower bud and fruit development plus plants like some air flow. Fewer branches means less fruit and while that might sound like a bad thing at first, producing less actually helps the tree give all it’s energy to the fruit that’s left, making it bigger and higher. I know it’s painful to get in there and cut out all that potential fruit but you can do it. And on this same note, and you’re probably not going to like the sounds of this, but the first year you plant your fruit tree, remove all the fruit. I know, I know. Believe me, I know. It’s hard…especially when your tree may have come with fruit already on it. But removing it will allow the tree to put its energy into forming a root system and getting established. I tell myself the fruit is just going to be that much sweeter going forward. There’s two kinds of pruning cuts. Thinning cut – This type of cut helps create the tree form. Here the whole branch is removed all the way down to another branch (don’t leave a stub) and cut at an angle. 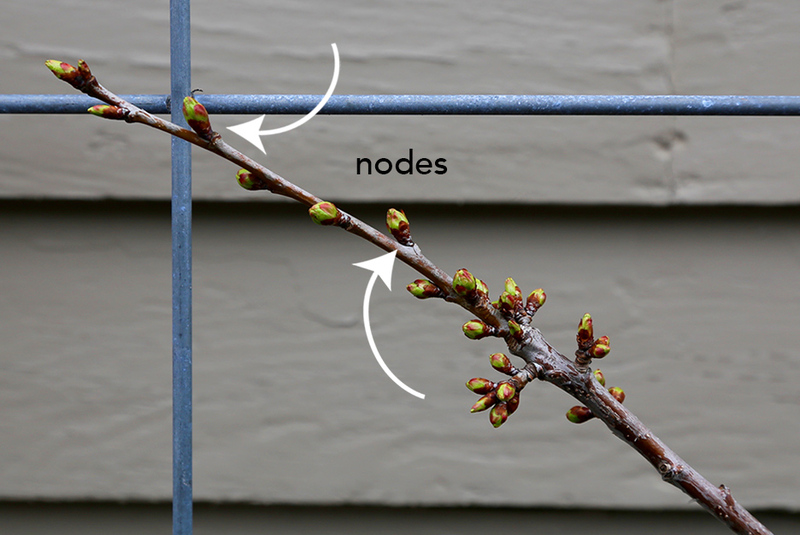 Heading cut – Here a branch is “tipped back” meaning it’s removed to just above a node (the slight bump on a branch where new leaves emerge), encouraging the growth of a lot of new branches. This kind of pruning controls tree size and is used to encourage fill in foliage. 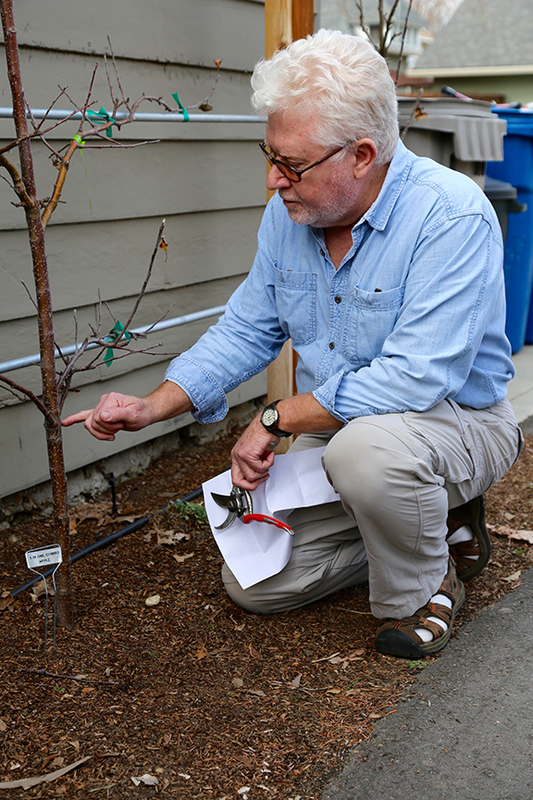 With all these new fruit trees in the alley and John’s great advice, it’s time to sharpen my clippers and get this pruning party started! I especially like the 3 in 1 esplariar salad apples with multiple varieties grafted on one. Thanks for the comment! Did you see that we also have pears and cherries that have multiple varieties on one tree. I didn’t even know this kind of thing existed until last summer and thought they were SO cool! Have a super day! I never would have thought you would need to prune it that much. Seems like more than the 10% I usually see. Hi Ronald! I think with the espalier it requires heavier pruning. I’ve gone back a couple times this summer and cut back some more as we are really trying to keep them as flat as possible so they don’t get hit by the garbage trucks. Thanks for you comment and have an awesome day.